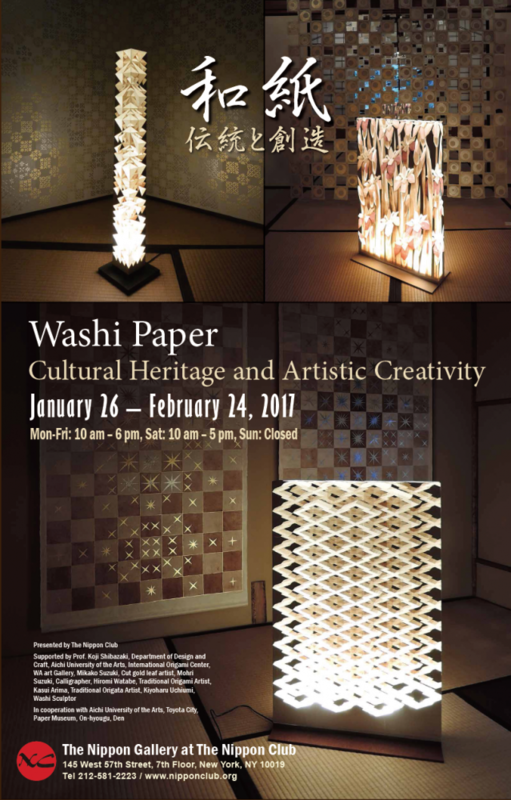 Washi, known as Japanese handmade paper, is “thin, strong, and beautiful” and a symbol of Japanese craftsmanship. A work of art in itself, this traditional paper has found a place not only in the restoration of cultural properties by virtue of its unique durability, strength, and eco-friendliness, but also as a popular material for paintings, fine arts, lighting fixtures, and interior design. With its wide method of production and use of a variety of raw materials, there is a possibility that new and creative applications of handmade washi will give rise to a resurgence of this traditional craft. Involving a labor-intensive process and using a large range of resources, traditional washi has gained the admiration of people worldwide. In this exhibition, discover the beauty and functionality of washi firsthand through a variety of classic Japanese art forms reinterpreted by contemporary artists and designed to introduce visitors to the historical and creative value of washi. In order to create darkness, all the windows of the gallery are covered by washi tapestry. In this way, a subtle and profound atmosphere is created within the exhibition space, representing the relationality of the lanterns, karakami (traditional craft for interior decoration), and calligraphy on the kekejiku (hanging scroll) of the traditional Japanese house. Amidst the quiet play of light and shadow created inside the gallery, visitors are transported back to an era where the only source of light in the home emanated from a single washi lantern. We introduce the history of traditional handmade washi, the aesthetic beauty of kirikane through the subtle light reflected from haku (gold or silver foil), origami & origata, modern washi sculpture, and sho by a calligrapher whose brush strokes are drawn on handmade washi. Workshops are held during the exhibition. If you have any questions, please do not hesitate to contact us. Handmade Washi Lanterns: Artworks using the technique of visual illusion with layered washi and washi art tapestry. He is the director of the exhibition. Kirikane: Artworks of hand-cut gold leaf with intricate decorative patterns. Sho: Calligraphy on handmade washi paper. Origami: The Japanese tradition of paper folding. Origata: Another form of origami.Origata is the art of wrapping gifts in paper, often used as decoration for special ceremonies. Washi sculpture: Washi dolls costumed in clothing of Heian period (794–1185).